Gadget Girl hates to drive for food. Wait, rephrase that, she hates driving to unfamiliar destinations. Hence, I was somewhat nervous when I watched her circle for a parking spot along Lower Lonsdale. I swear there was steam coming out of her ears as she drove by. I was even more afraid when our original restaurant of choice, Fishworks, was completely full. 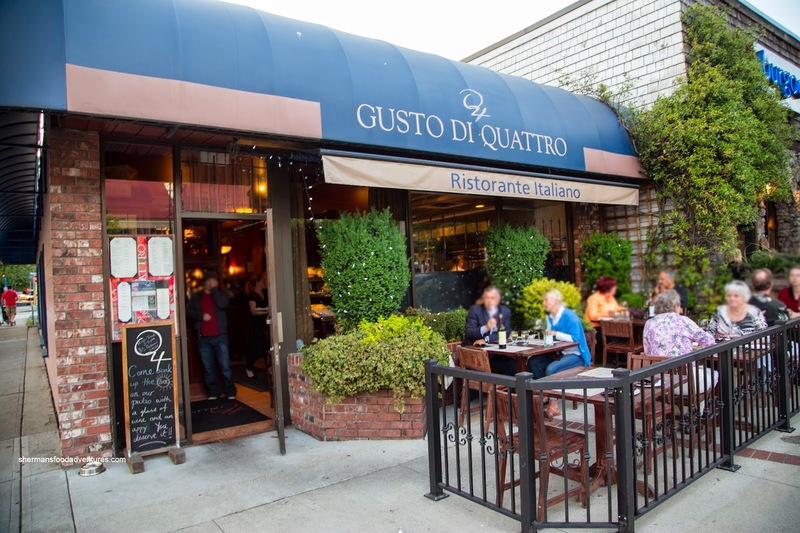 Fortunately, Emilicious made the executive decision to eat at nearby Gusto di Quattro instead. My life was spared! Besides, we knew the food would be good since it is the North Van location of the popular Q4. At first, only Emilicious and I were sharing a salad to start our meal. However, with a little coercion, I was able to get Milhouse to join in as well. 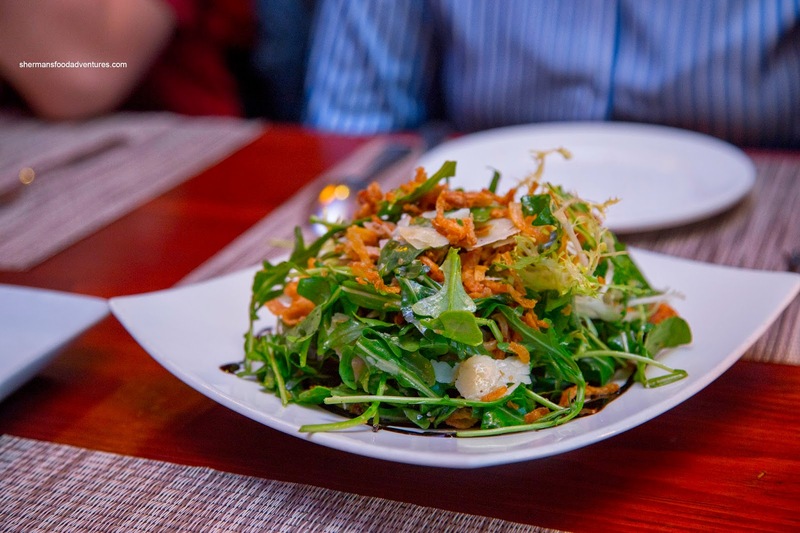 So we ended up splitting 2 salads beginning with the Wild Arugula with shaved Parmesan, fresh lemon, EVOO, balsamic reduction & crispy onions. This was a well-thought out concoction which hit a collection of flavours and textures. Crispy and sweet, the onions added the necessary crunch while the lemon and balsamic reduction provided both acidity and sweetness. All of these components combined nicely with the peppery arugula and salty Parm. 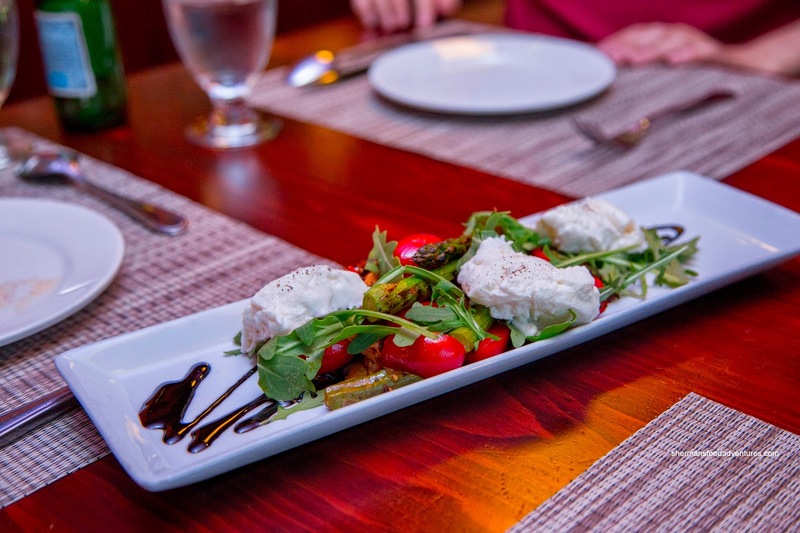 Our next salad was the Fresh Burrata Cheese consisting of chorizo, grilled asparagus, tomatoes, arugula and balsamic reduction. The creamy cheese was amped by the salty and spicy chorizo (which was crisped up). With both acidity and sweetness from the tomatoes and balsamic, this was another fine marriage of flavours. We also decided to share 3 pastas including the Fusilli con Rucola consisting of shaved beef, wild mushrooms, truffle porcini cream and Parmesan cheese. This was a rich, creamy and extremely Earthy dish where I could smell the truffle oil from afar. Combined with the different mushrooms, it made it extra woodsy. For me, I liked it, but I can see how it could be overwhelming for some people (as it was quite greasy). 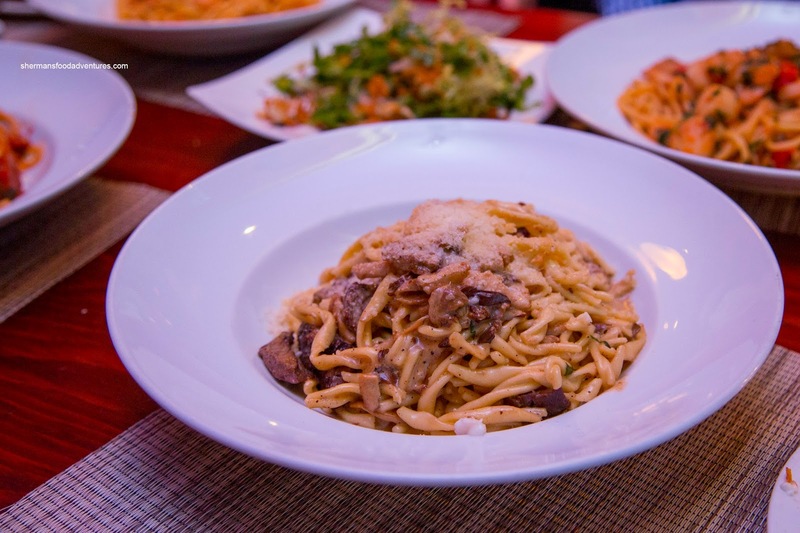 I enjoyed the toothsome fusilli as well as the tender mushrooms and equally moist beef. 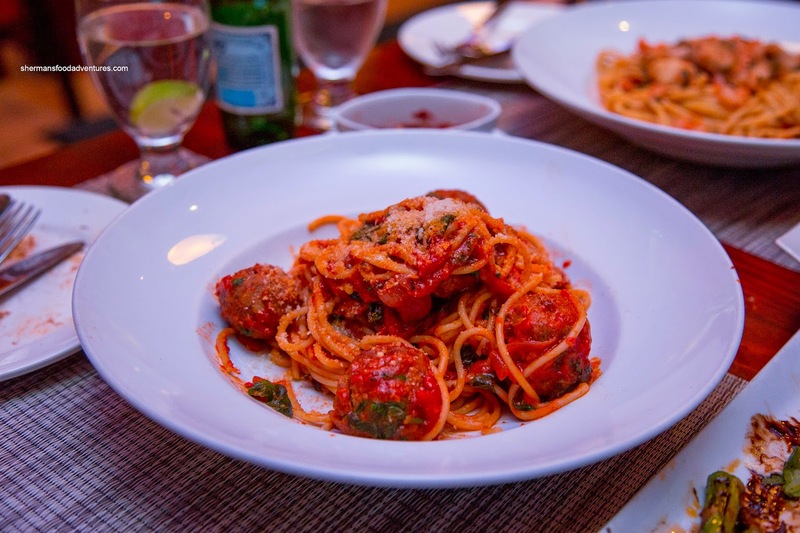 Next, we had the Spaghetti con Polpette with house-made pork & beef meatballs simmered in red wine & tomato sauce and finished with fresh herbs. Again, the pasta was a firm al dente while the meatballs were moist, somewhat loose and exhibiting plenty of depth of flavour. What really brought everything together was the fantastic chunky tomato sauce that was tart with a smidgen of sweetness. 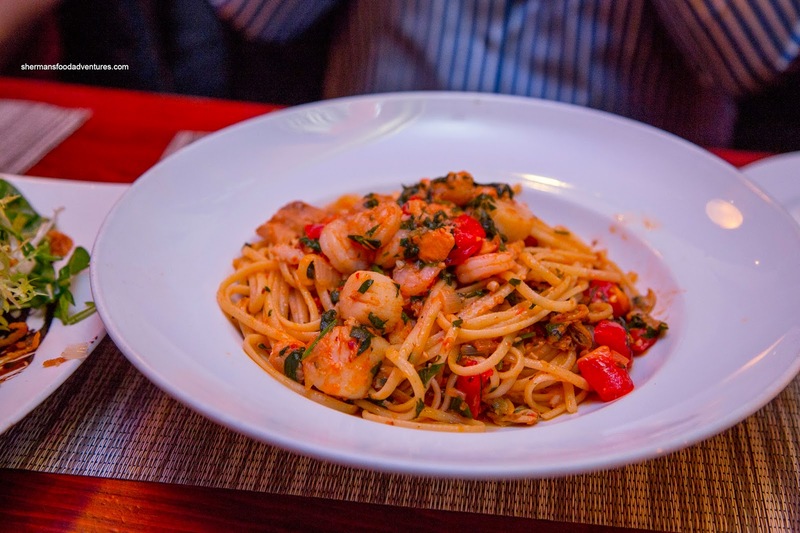 Lastly, we shared the Linguine di Mare with rock shrimp, scallops, mussels, clams & fresh fish, tomatoes, garlic, chili & herbs. This was the most subtle-tasting of the 3 with only mild hints of garlic and chili. There was plenty of seafood though consisting of plump scallops, flaky fish and crunchy shrimp. Personally, I would've liked to see more salt added to this dish. However, as a whole, we thoroughly enjoyed our meal despite the premium pricing. Quoting Milhouse, "it is okay to spend money on good food".